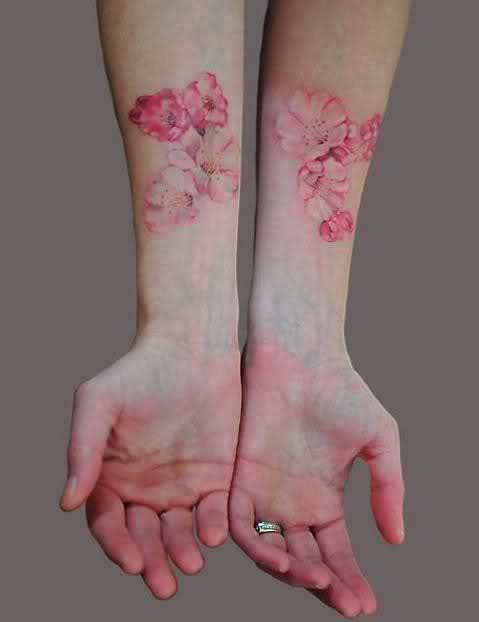 Beautifully detailed and shaded cherry blossom flowers on a girl’s inner wrist done in soft pinks and neutrals. Cherry blossom flowers look so beautiful on branches or alone like this girl has on her inner wrists. The flowers are perfectly shaded for variation and detail in pinks, whites, and neutral colors. The centers of the flowers have more detail in their design than normally seen in Chinese or Japanese art. This color pallete keeps the tattoo soft and simple and could also be done in lavenders without making it look too bold. Little birds or butterflies would make great additions to these flowers as well.